As announced Apple has released the iOS 8.1 update and it is now available for download. The new software update brings several bug fixes and a few new features to the operating system. Most notably it activates the highly anticipated Apple Pay feature that would allow iPhone users to make purchases at selected stores using the Touch ID sensor and NFC capability of their device. Apart from the iOS 8.1 brings back the camera roll for the stock camera application and also introduces the new iCloud photo library, which allows users to access their photos using any computer through iCloud.com. Another feature this update brings is ability for iPad and Mac users to be able to send SMS once they are connected with the iPhone. The update has been released for all iOS 8 running iPhones, iPads and iPod touches and carries a build number of 12B411 for the iPhones and 12B410 for the iPads. 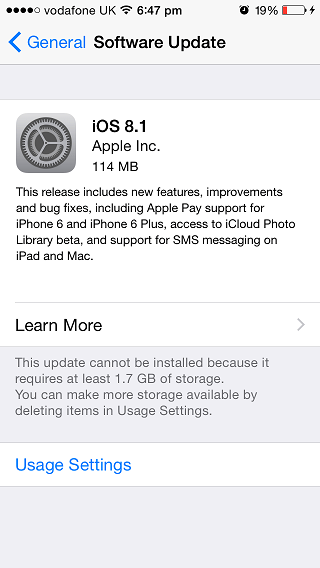 To install this update through OTA you will need to have at least 1.7GB of free disk space available.